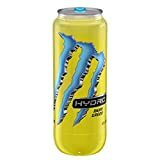 Monster Hydro Energy Drink is a non-carbonated, lightly sweetened beverage from Monster Energy. This version of Monster will appeal to those who love sports drinks like Gatorade, but also want the caffeine and other energy ingredients an energy drink provides. Monster Hydro isn't suitable for children or those sensitive to caffeine. Filtered Water, Sugar, Glucose, Taurine, Citric Acid, Sodium Citrate, Potassium Sorbate (Preservative), Gum Arabic, Sodium Benzoate (Preservative), Caffeine, Monopotassium Phosphate, Salt, Natural Flavors, Ester Gum, Sucralose, Niacinamide (Vit. B3), Inositol, Pyridoxine Hydrochloride (Vit. B6), Yellow #5. How Does Monster Hydro Energy Drink Compare? Monster Hydro Energy Drink contains 7.81 mgs of caffeine per fluid ounce (26.42mg/100 ml).